Peter Brand is one of the best, very dark coloured Peonies in the late season. With a beautiful double, very deep maroon red flowers and yellow stamen in between. Peter Brand has an excellent use for cut flower production as well for landscaping in gardens and city parks all over the world. Every year older the plant gives more and more flowers. 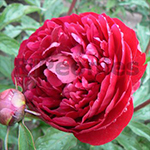 In Holland you can find the best conditions for nursing Peonies, Pfingsterrosen or Pivoines. Dutch growers sell high quality Peony tubers all over the world.